We recommend our dedicated media which has been shown over time to perform consistently and reliably with our pathogen ELISA tests. Good, consistent quality is important for the sensitive detection of target organisms and also the control of false positive results due to overgrowth of any background flora. 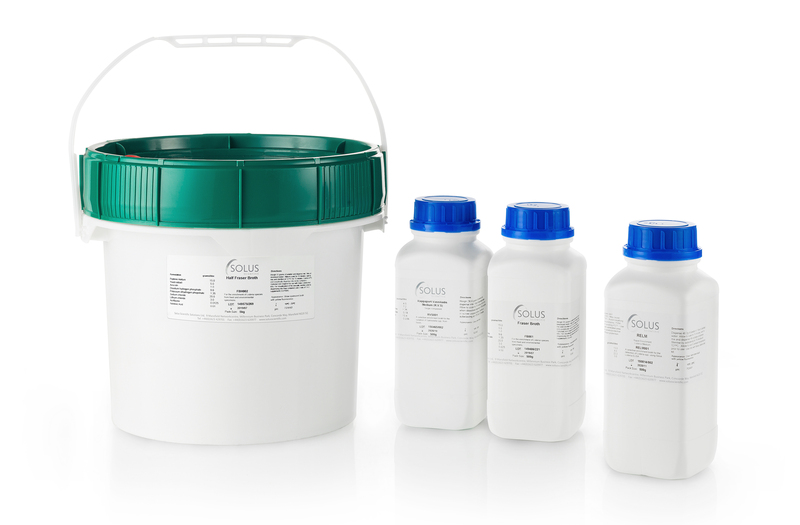 Solus dedicated media is available for our entire pathogen testing range in a number of convenient formats. SOLO+ is the dedicated media for our Solus One Listeria immunoassay and contains all the required selective components in the dehydrated powder blend. This has been shown to give consistent batch to batch performance for enrichment of Listeria and increased growth levels of the slower growing Listeria sp. by including high quality buffering constituent parts, peptones and optimised selective components. The medium also controls the overgrowth of non-target bacteria that might interfere with performance of the assay. Solus One Salmonella supplement was formulated to complement Buffered Peptone Water for use in our Solus One Salmonella immunoassay. Solus One Salmonella supplement controls the overgrowth of non-target bacteria that might interfere with performance of the assay. This Broth is formulated as according to ISO 6579 and has been selected for its compatibility with the Solus Salmonella ELISA test. It gives very consistent growth and isolation of Salmonella sp. and has optimal selective properties resulting in the excellent suppression of background flora that can sometimes interfere with the ELISA test when inferior RVS broths are used. This broth was formulated to complement our Listeria ELISA test and contains all the required selective components in the dehydrated powder blend. This has been shown to give consistent batch to batch performance for enrichment of Listeria and controls the overgrowth of non-target bacteria that might interfere with performance of the ELISA. We do not recommend the addition of ferric ammonium citrate but it can be added after the medium is autoclaved if desired. RELM is the secondary enrichment broth in the Solus Listeria ELISA method. The dedicated media was formulated to give increased growth levels of the slower growing Listeria sp. compared to the standard Fraser Broth by including high quality buffering constituent parts, peptones and optimised selective components. This results in consistently superior growth levels of Listeria compared to standard enrichment media. Solus Agar-OA is a selective medium for the isolation and presumptive identification of Listeria monocytogenes from foodstuffs and related materials as described in ISO 11290-1:1997. Lithium chloride in the base medium and supplementary antimicrobial compounds Ceftazidime, Polymyxin, Nalidixic acid and amphotericin provide the medium’s selectivity. Chromogenic activity is as a result of a chromogenic substrate for the detection of the β-glucosidase enzyme, common to all Listeria spp. and to a few strains of Enterococci and Bacilli.